It's Muffin Tin Monday, and today's theme is picks and skewers. 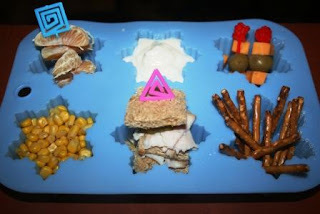 Pierce had clementine orange slices, yogurt, skewers of cheddar and green olives, corn, a sandwich of whole wheat, smoked turkey, pickles and olives, and some pretzels. Because pretzels are kind of skewerish themselves. Oh I love this!!! Have I missed other Mondays like this?!? These looks great! How did he like the picks? love it. also. yes. pretzels are quite skewerish. My kiddos would love this lunch, looks great. I like your snowflake tin too. Looks so yummy! Happy New Year! G'day, first visit. My son is a marathon runner & does many you do. Where are you in VA, we are in MD. Looks like a yummy lunch. Never thought of the pretzels that way, but so true. My girls requested green olives from the store a few weeks back. They refuse to eat them. Figured they wouldn't like them. Unfortunately no one else does and I am not fond of them either. Looks like a yummy tin. I like the idea that Pierce got to eat his skewers (or pretzels, anyway)!